Biography: Banjara Church and Indian Banjara Tribal Development Trust began in 1987 as an independent gypsy ministry to reach the lost tribal gypsy people - Lazarus' people. 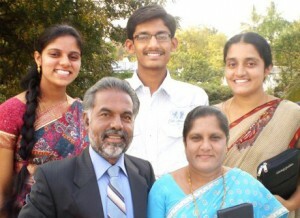 Lazarus and Susheela have had a strong desire to reach this uneducated group with the love of Jesus Christ. They have three grown children and their son Isaac works along side of them as an associate and children's pastor. They have planted two or three churches in every tribal village where there is no pastor or church. Their vision is to plant churches in every tribal village. The main focus of the ministry is on evangelism, soul winning, intercession, youth and children's ministries. The Dharavaths have started an orphanage exclusively for gypsy children. Lazarus tells us, "This is opening doors for us to reach the tribal villages and share the gospel." They currently have over 30 children who have lost their parents by different causes. Strengths: Lazarus and Susheela's strengths are their loving pastor's hearts toward those in need as well as those who society has cast aside. Family: Lazarus and Susheela have three grown children.